‘The Man Who Planted Trees’ (1953) is a short story by Jean Giono, one that provides a rich seam of imagination for DUO’s social and ecological engagement within Dundee. Over the years the narrator returns to visit Bouffier and recounts his experience of witnessing a once barren land being returned to forest. DUO – over a four-year period and in collaboration with hundreds of individuals and twenty-five community orchard groups across the city – have attempted to perform a similar act of regeneration within Dundee. Unlike Giono’s story, however, we celebrate the collective action of orchard planting, not the singular celebration of one man planting trees. 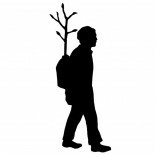 For this reason, and orchard by orchard, our ‘black silhouette’ figure (as seen in our logo) was joined by many other characters: school children, gardeners, musicians, jugglers, and various orchard loving animals and plants. In addition to the general theme of reforestation we appropriated other visual, linguistic and mythological elements from The Man Who Planted Trees. We used the first siting of Bouffier as a ‘black silhouette’ to indicate future urban orchard sites – these as ‘shadow markers’. We also incorporate the shepherd image into our leaflets. The silhouette, as shadow figure, also draws attention to the provisional nature of our project and the possibility that Dundee might, in the long run, fail to become an Orchard City. Here we acknowledge the socio-political context in which we live and the dominant model of urban regeneration which prioritises economic growth over and above social and environmental health. Our commitment to sustainability (which re-prioritises social and environmental benefits over and above economic growth) may, to some people, seem foolish. If so, Bouffier provides an appropriate name for our activity as we dedicate ourselves to the buffoonery of Bouffier! Only time will tell. In the meantime we plant trees.